So, graze. Wander past places that you know, that you might want to know, or that you’ve heard you should want to know in the 50 states and Canada. Seek relaxation, inspiration, information. Like others in the 1,000 . . . Before You Die series, this is a brick-sized paperback coffee table book, two inches thick, with hundreds of color photographs. Obviously, it is not meant to be read from cover to cover. Yet wherever you roam, from Newfoundland to Ni’ihau, from Baffin Bay to Big Bend, you are bound to be surprised. And you might be ready to pack your bags immediately to reach someplace that calls to you. Did you know that the Route 14A scenic byway on the way to the Medicine Wheel, an ancient Indian sacred space in Wyoming’s Bighorn Mountains, is believed to be “the most expensive stretch of road built in the U.S.” thanks to its steep and rugged terrain? That not until the 1960s did Norwegian archeologists excavate an 11th century Viking settlement at L’Anse aux Meadows on Newfoundland’s great Northern Peninsula, establishing it as the oldest site yet found of a European colony on this continent? That the Pérez Art Museum Miami (PAMM), opened in 2013, is regarded as that city’s first world-class museum? The book is organized by regions: East to West, first the U.S., then Canada. For every entry—a place, a city, an event, a basket of festivities, a celebration, a drive, and so on—Patricia Schultz, who surely wore out dozens of wheeled suitcases and maybe auto tires, includes descriptions, directions, where to stay, sometimes where to eat, best time of year to visit, websites, and phone numbers. Her unflagging enthusiasm and bright writing (the Bighorns resemble “an enormous molar” rising from the plains) could make a traveler out of even the most adamant homebody. The “Musical Journeys” index is huge; it is also a mite arbitrary and oddly arranged. Among rock music festivals, Lollapalooza rates a mention; Bonnaroo and Coachella do not. In classical music, New York’s Lincoln Center and Carnegie Hall are grouped together as one entry. The revived New York City Opera is indexed but nothing appears on the page cited. Sports fans, military buffs, outdoorsy folks, and history lovers will appreciate the enormous range of places presented here with careful details. Some questions do arise. There is such a good selection of iconic baseball parks, but besides the once-a-year Pro Football Hall of Fame venue in Canton, OH, why no NFL stadiums? Not even the Green Bay Packers’ historic Lambeau Field. These may be simply matters of choice (sorry, Cheeseheads). More notable: numerous recommended lodgings are pricey (the Amangiri resort near Lake Powell in the Southwest’s Four Corners where room rates start at $1500 a night? Seriously?) On the other hand, many resorts are landmarks (the Hotel Del Coronado near San Diego, for example) that are awarded entries of their own. 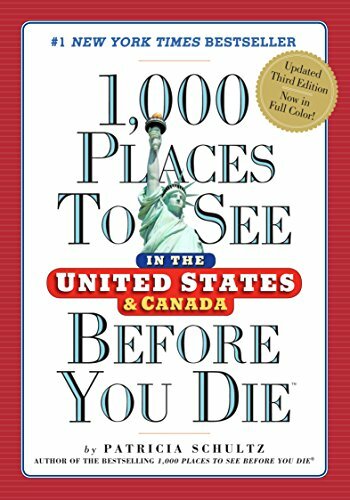 Overall, the latest edition of 1,000 Places to See in the United States and Canada Before You Die is a useful compendium packed with must-visit, or at least ought-to-visit, sites and experiences in this vast, gorgeous country and that of our neighbors to the north. Europe, Africa, and the South Seas can wait; this time, light out for the territory of North America.